Is the skin around your eyes crying out for some quick TLC? Whether you were out late on a delectable date, have an early morning roll call, or need a soothing infusion before your next Instagram, this firming, toning, revivifying blend will have your eyes sparkling once again! Directions: Use the dropper to apply a luscious drop to your palm. Using your fingertips, gently pat the serum around the eye. 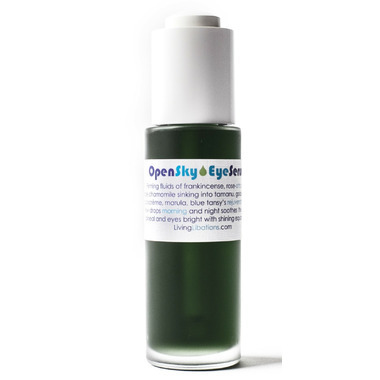 Super for solo use or apply with deeply hydrating All Seeing Eye Cream. Smooth over face and neck to reap the cooling botanical benefits of beautiful. Excellent under makeup. Ingredients: Simmondsia chinensis (Jojoba), Cocos nucifera (Virgin Coconut), Boswellia carterii (Frankincense), Rosa Damascena (Rose Otto), Mentha piperita (Peppermint), Tanacetum annuum (Tansy), Eriocephalus punctulatus (Cape Chamomile), Matricaria chamomilla (German Chamomile), Lavandula angustifolia (Lavender), and Thymus vulgaris linalool (Sweet Thyme). I am hugely skeptical of eye treatments normally. I recieved this as a Christmas present and all i can say is this product is magical! Not only has it reduced fine lines around my eyes and lips, made my skin far less crepey looking, it also acts as a calming spot treament in areas where i have redness due to hormonal changes. I am delighted by this product in so many ways! I love the product to hydrate my skin around the eye, but it does not reduce dark circles.